Motorola's Moto E has turned up in multiple press shots online showing off the new phone before its launch at the company's May 13 London event. 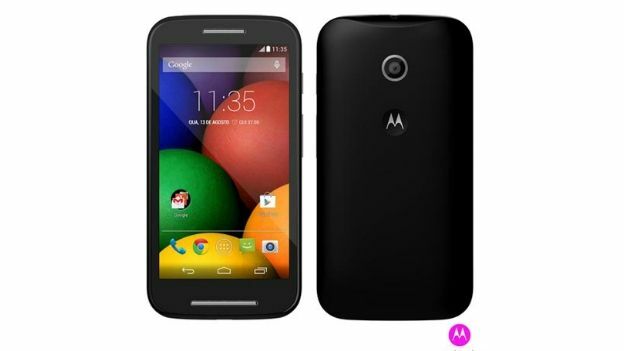 Tecnoblog came across a listing of the Moto E on Brazilian online shopping site, Fast Shop. It revealed a press image of Motorola's budget phone in black and white bearing similarities to the previous Moto G.
The press image also looks identical to others that circulated on Twitter, featuring the same long bar on the bottom and same familiar Moto design. The back of the handset is also shown with the recessed "M" circle and swooping upper edge, although lacks the speaker near the camera featured on the Moto G.
The listing also reveals the Moto E specs including a 4.3-inch display, 5 megapixel camera, 4GB of storage, 1GB of RAM and a 1.2GHz Qualcomm processor. It also states that the phone will come with a microSD card. The Moto E runs on Android 4.4 KitKat out of the box and according to the listing, the smartphone is guaranteed to receive the next major Android operating system update. It will be available in black, turquoise and lemon colour options and is rumoured to carry a price tag lower than that of the Moto G.
The leaks have lifted the lid on the Moto E, ahead of its expected launch at Motorola's big event in London on Tuesday. "Connect more people to the world's information and each other, and they can do great things," announced Motorola via its invite. "Introducing the next smartphone from Motorola to make these connections happen. Made to last. Priced for all." The invite suggests that Motorola has some other budget offerings up its sleeve, as it continues to push entry-level devices to emerging markets.